Today’s animation is an 18th century smoking pipe recovered archaeologically by the Colonial Williamsburg Foundation (CWF) from Williamsburg. It was scanned in CWF”s archaeological collections facility on November 4, 2013. Today’s animation is a 17th century smoking pipe recovered archaeologically by the Colonial Williamsburg Foundation (CWF) from the Carter’s Grove site. It was scanned in CWF”s archaeological collections facility on November 4, 2013. The bowl of the pipe was “closed” by our scanner’s software, which perceived the opening as a data hole. We can scan in such a way as to avoid this issue, but this is a time-consuming process. Today’s animation is a 19th century child’s leather shoe from the research collections of the Colonial Williamsburg Foundation.It was scanned during a demonstration of 3D scanning technology at CWF by Courtney Bowles, Allen Huber, Ashley McCuistion, and myself on June 27, 2012. Because of the fragility of this shoe, the flat bottom of the shoe was not scanned but rather was auto-filled in by editing software. 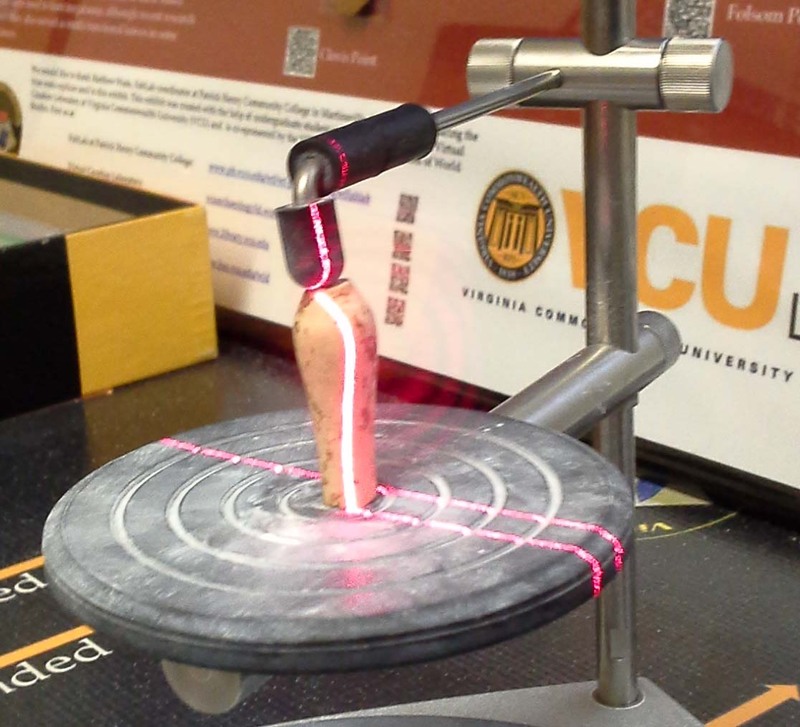 Today’s animation is a the base of a stemmed point scanned in the Virtual Curation Laboratory by VCL intern Rachael Hulvey on April 12, 2012. This point is on loan from the Fort Lee Regional Archaeological Curation Facility (RACF). RACF Curator Amy Wood will use printed replicas of this point in public programs. Today’s animation is a Kirk Corner Notched Point scanned in the Virtual Curation Laboratory by VCL Digital Curation Specialist Lauren Volkers on February 27, 2014. This point is on loan from the Fort Lee Regional Archaeological Curation Facility (RACF). RACF Curator Amy Wood will use printed replicas of this point in public programs. Today’s animation is a plastic toy soldier recovered archaeologically at George Washington’s Ferry Farm. This toy was played with by one of the children that live on this property in the latter part of the 20th century A.D.
Today’s animation is a rim sherd with lug from the Consol site, a Monongahela tradition village. It was recovered archaeologically by members of the Westmoreland Archaeological Society, a chapter of the Society for Pennsylvania Archaeology. I scanned this sherd on July 12, 2012. Today’s animation is an agate stoneware figurine fragment recovered from a ca. 1755 context associated with George Washington and his family in the home where he grew up as a boy from the age of 6 until his early 20s. This fragment of a monk’ figurine from Staffordshire, England, would have been part of a set of other figurines that adorned the mantle over the Washington family’s fireplace. As such, this figurine expressed the Washington family’s keen fashion sense as part of the Virginia gentry class. It was recovered archaeologically at George Washington’s Ferry Farm and scanned in the Small Finds Laboratory at Ferry Farm. The figurine was dusted with a neutral talc powder to facilitate the scanning process. Today’s animation is a complete wig hair curler with residue from an 18th century context associated with George Washington and his family in the home where he grew up as a boy from the age of 6 until his early 20s. It was recovered archaeologically at George Washington’s Ferry Farm. This animation was created by Lauren Volkers, a Virginia Commonwealth University alumnus excavating at Ferry Farm this summer. Lauren also edited the digital model generated during the scanning process. A popular summary written about a wig hair curler residue analysis project by Laura J. Galke, Artifact Analyst and Field Director, George Washington’s Ferry Farm, can be found here. Note: the linear dark patterning along one side is not residue but an artifact of the scanning process. Today’s animation is a wig hair curler from an 18th century context associated with George Washington and his family in the home where he grew up as a boy from the age of 6 until his early 20s. It was recovered archaeologically at George Washington’s Ferry Farm. This animation was created by Lauren Volkers, a Virginia Commonwealth University alumnus excavating at Ferry Farm this summer. Lauren also edited the digital model generated during the scanning process. Note: the following text is from a popular summary written about a wig hair curler residue analysis project and provided by Laura J. Galke, Artifact Analyst and Field Director, George Washington’s Ferry Farm. A collaborative venture between the George Washington Foundation (GWF) , Fredericksburg, the Virginia Commonwealth University (VCU), Richmond, and the College of William and Mary Applied Research Center, Newport News, has uncovered evidence for mid-eighteenth century wig powder on fired-clay artifacts unearthed at Ferry Farm, the boyhood home of George Washington, Stafford County, Virginia. During the eighteenth-century, wigs or ‘perukes’ were an essential component of stylish male attire. The most fashionable of these hairpieces featured curls. These curls required maintenance by a gentleman’s hairdresser, which included periodically re-setting the curls and applying a lard-based pomatum followed by a dusting of powder. The historical record documents that wigs were worn by at least one of George’s three brothers at Ferry Farm: Samuel Washington. A wig hair curler with residue as it is being scanned. Archaeologists at Ferry Farm have recovered almost 200 fired-clay wig hair curlers. At Ferry Farm, these curlers were tools used to re-set a wig’s curls. GWF archaeologist Laura Galke noted that a few of the curlers retained visible black, white and translucent residues and speculated that they may reflect materials used for wig hair care during the middle 1700s. VCU anthropology professor Dr. Christopher Stevenson became aware of Galke’s hypothesis and agreed to form a research partnership to analyze the residues. Stevenson invited a team of material scientists at the William and Mary Applied Research Center to analyze the residues. One of the great challenges facing the team was how to analyze such minute traces. The incredibly small size of the residues, consisting of a few milligrams of material, required a sampling method technique appropriate for such tiny deposits. Drawing on the resources of the Applied Research Center, scanning electron microscopy/ x-ray fluorescence and infrared spectroscopy were used to characterize the deposits. The x-ray analysis provided an elemental analysis of the residue while infrared spectroscopy resulted in spectra that identified organic compounds. The results suggest that a few of the Washington family curlers retained hair powder made from either wheat flour or white kaolin clay. Pulverized shell was also mixed in with some of the clay and powder deposits. In addition, some curlers exhibited rusted iron residues, which Galke believes to be the remains from iron hair pins used to hold the curlers in place while the wig hair was styled and set. This is the first time that residues on historical wig hair curlers have been analyzed in a systematic scientific fashion. The preservation of 250-year old residues on curlers has never before been documented. The use of curlers as part of a home-based wig hair maintenance regimen at George Washington’s boyhood home represents a new discovery about our first President’s home, where he lived between 1738 and early 1754. The team will present their findings at a statewide conference this October. They hope to inspire similar collaborative projects and analyses using other curated collections.